Review written by and copyright: Rick Curzon (13th January 2019). 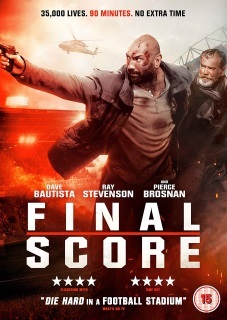 It's Die Hard in a football stadium when an ex-soldier (Dave Bautista) has to use all his lethal fighting skills to save 35,000 fans and prevent mass destruction when deadly Russian terrorists take Upton Park under siege. Believing his traitorous brother Dimitri (Pierce Brosnan) is somewhere in the stadium, Arkady (Ray Stevenson), the former leader of a revolution in the Russian state of Sukovia, locks down the Boleyn Ground during the European semi-final between West Ham United and Dynamo FCC. Slick, agreeable, amusing ripoff of Die Hard (1988) and Sudden Death (1995) and pleasingly made in Britain at a West Ham match and in their now defunct old stadium. A vehicle for Dave Bautista building him into an effective action star with Ralph Brown, Ray Stevenson and Pierce Brosnan in support. Nothing new and very silly (like Die Hard et al) but it's well done all round and decent no think entertainment. Signature Entertainment bring this homegrown slice chedder to DVD and Blu-ray although only the DVD was provided for review. We have a fairly standard high definition transfer of a brand new film that was shot digitally using Red Dragon cameras. You know the score; a slightly muted colour effect with high contrast, plenty of fine detail and deep black levels ... when seen in full HD. This DVD is obviously a major downgrade by comparison, but is still a decent product. The film makers have given this a decent, colourful look and the transfer looked very pleasing for the format on my 58" 4K display. Black levels were satisfying and there didn't appear to be much unintended crush. Contrast was decent and detail did manage to break through the fog of standard definition quite pleasingly. I did notice the odd moment of posterisation in some of the darker scenes when I got up close to the image (say a foot or two off the display) but it wasn't noticeable from a normal viewing distance (in my case ten feet). I'll also point out that my display is correctly set up using a professional setup disc which tends to ensure that decent basic transfers - like we have here - look good in either SD or HD. There was some noise in the image but again I find that's fairly standard for DVD. This is a single layered DVD. Had Signature Entertainment sent me the Blu-ray the image would most likely be in the 'A' range provided the encoding is good. Lively, lossy Dolby Digital tracks of state of the art modern Action film making which is to say my 5.1 system got a real workout with plenty of active surround and LFE with the subwoofer engaged frequently. I heard little by way of distortion but being lossy the track was muted by comparison to lossless and required the volume to be higher than normal. The 2.0 was obviously less robust with weaker fine detail but was still decent enough. Standard EPK puff piece and very short even for that. Need I say more. Standard trailers that play on loading the disc into the player. An entertaining piece of thickear gets a solid standard def transfer on a single layered DVD of a modern digitally shot production. Sound is equally decent but but extras are barely worth the term. A shame because the US release has a commentary track which hasn't been ported over here.